The Latino College Fair allows students and parents/guardians to meet and talk with more than 50 independent college and university admission and financial aid representatives. The “Planning and Paying for College” workshop will help students and their families better understand the admissions and financial aid process and programs. The session, simultaneously translated into Spanish via headphones, will cover college affordability, including explanations of grants and scholarships plus financial aid forms, terms and deadlines. At the conclusion of this workshop, The Sallie Mae Fund will hold a drawing for a $500 scholarship for high school seniors only. The “Ask the Financial Aid Expert” stations provide students and families an opportunity to sit down with financial aid experts to get answers to their specific questions about paying for college. This event is funded primarily through a federal College Access Challenge Grant (CACG) awarded to cIcu by the New York State Higher Education Services Corp, the state agency designated to administer CACG. 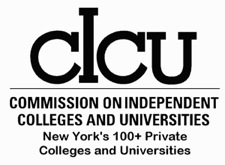 Remaining funds come from cIcu, Fordham University, cIcu member colleges and universities and the Sallie Mae Fund. With thanks to the Bronx Assembly Delegation for their support. CAUTION: Plan for traffic! There is a home football game the same day. Additional information for parking and any travel information will be e-mailed to those who complete the form below. If you have questions, please contact Sabra-Joi Dingman, Assistant Director of Outreach Programs, cIcu, at 518-436-4781 x23, or via e-mail at sabra@cicu.org. Check back for program updates and additional information as the event draws near. * 1. Please fill out the information below to register for the 2011 Latino College Fair. This will help us plan for refreshments and materials. We will also e-mail you a parking voucher to waive the $11.00 parking fee. Thank you. * 3. What grade are you (or the students you will be bringing) enrolled in during the 2011-2012 school year? * 4. Including yourself, how many individuals will you be bringing with you to the 2011 Latino College Fair? * 5. How did you hear about the 2011 Latino College Fair? When using a GPS, the following address will bring you to the driving/parking entrance of the campus: 2853 Southern Boulevard, Bronx, NY 10458. Detailed driving directions are below. blocks from the University (walk 6 blocks East to campus). • For local bus service, take the Bx9, Bx12, Bx22 or Bx61 to the University. • You may wish to view a bus map available online through The MTA website. Avenue gate will be a few steps ahead of you, on your left. of New York and New Jersey website. Botanical Garden will be in front of you). Take a right onto Southern Boulevard. Fordham's main entrance is at the third light. Turn right. Blvd. After 1/4 mile, turn left at the light into the University. turn left at the light into the University. 1/4 mile, turn left into the University.